EQUIOS | SCREEN Graphic Solutions Co., Ltd. Evolve to solution platformEQUIOS builds on the innovative prepress technologies established in Trueflow, combining a universal workflow concept with the latest technical advances. As a solution platform, EQUIOS delivers a major step forward in automation and ease of use in all stages, from overall process design and imposition to progress and quality management. 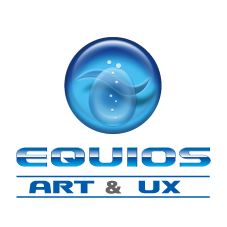 EQUIOS ART & UXEQUIOS functions as an overall solution platform for SCREEN products, enabling the control of a wide range of devices. EQUIOS ART is a suite of technologies that help to ensure optimal quality standards across different SCREEN graphic arts products. 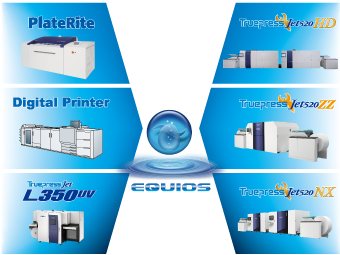 These technologies include SCREEN’s proprietary RIP, image processing and color management systems, which combine to produce images of consistently high quality on diverse printed materials. EQUIOS UX likewise provides a broad range of functionality across the entire production process from Web2Print input to printing and finally postpress. This includes support for user-friendly operations tailored to individual applications, automation of various repeated tasks and maintenance of links with a wider production system based on rapidly emerging IoT (Internet of Things) technology. Working synergistically, these technologies help to create a highly stable printing environment that delivers outstanding quality and productivity, with minimal operator skill requirements. Fully automated prepress processingRIP workflow development has focused on creating new ways to stream-line and accelerate processing. However, with the printing industry re-quiring ever wider options for differentiation and value creation, EQUIOS simply eliminates unnecessary operations. This approach improves overall workflow effciency and establishes the shift to value creation as a new goal for the industry. Nonstop processing from order receipt to job submission is now a reality with SCREEN’s Web to Delivery Automation concept. The most important factors in this approach are the conversion of the process plans for individual jobs to templates (action plans) and ability to automatically select appropriate templates based on the data input (linkage with up-stream devices). Latest RIP core improves stability of output resultsEQUIOS Version 6 incorporates Adobe’s latest RIP core, Adobe® PDF Print Engine 4, and latest Adobe® PDF Library. It also includes the latest 2017 version of PitStop for enhanced preflight functionality. In addition to ensuring compatibility with Adobe’s lates products, EQUIOS provides more stable output quality at even faster speeds. PDFs with transparency effects are now processed directly and the reproduction of line widths and colors composed of overprints both show major improvements. EQUIOS Version 6 significantly improves the productivity of the latest PDF-centered workflows, ensuring materials are output at high speed looking exactly as expected. 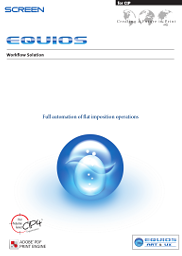 This is the 16th edition of the EQUIOS DTP Output Guideline. This document is composed of technical information for PDF/X-4 and tips and relevant cautions about how to create or output proper and acceptable data to EQUIOS using latest DTP applications. Descriptions about Trueflow issues, PostScript workflow, Adobe CS, CS2 and QuarkXPress6.5 are omitted in this edition. If you need those information, please see the previous edition: The 14th edition of the Trueflow DTP Output Guideline. This file is to be used for creating proper and acceptable environment in the latest applications to EQUIOS operation. Adobe Creative Suite and Adobe Creative Cloud applications are intended. Detailed usage is described in the EQUIOS DTP Output Guideline.